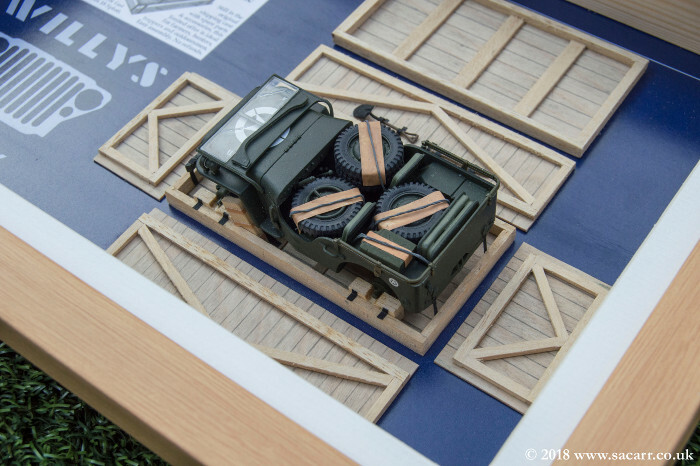 In the real world of military vehicle collectors, the "Holy Grail" would be to find an original Jeep in its shipping crate. Of course, other than those at the bottom of the Atlantic Ocean in the holds of sunken ships, it's very unlikely anyone will ever find one. 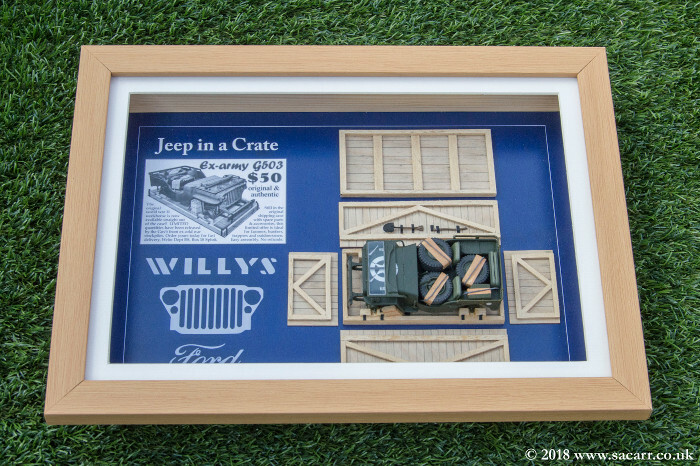 The whole "Jeep in a crate for $50" idea came from a post war scam, trying to con people out of their money. 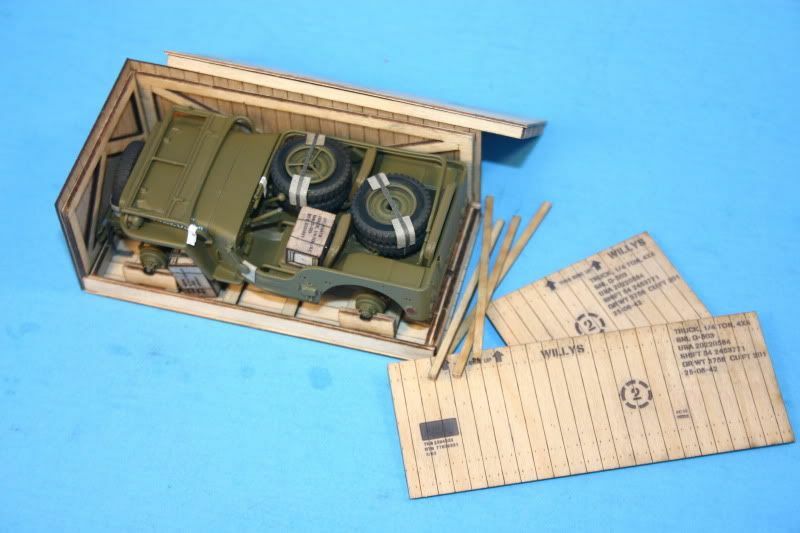 However, there are a number of photos around the net showing Jeeps in crates, although how they were packed and how disassembled they were seems to vary from picture to picture. This model was built for a friend, with the hood number matching his Jeep. 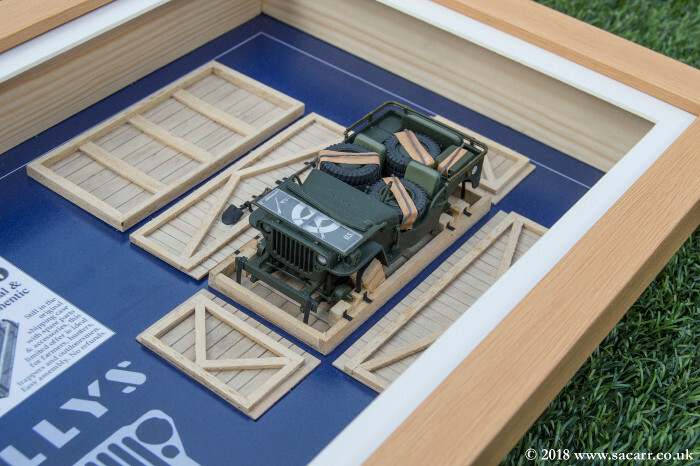 The Jeep is from the Italeri kit with a scratch built crate from ramin strip wood and 1/32 birch plywood. The metal tie down straps are black painted paper, with painted wire over paper holding the wheels into the tub. It is presented in an A4 box frame﻿. Very nice. I like the presentation. 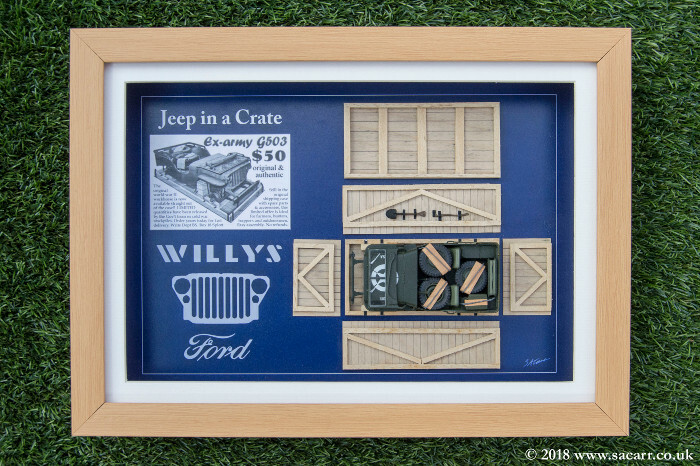 I did similar with a laser-cut wood kit a few years ago. Is the wood kit still available? Not that I need it now, just curious. Apparently so. I didn't pay anything near what it is listed at though. I think I found it on eBay for $25. It also includes resin wheel hubs and brake cyclinders. They have a bunch of other wooden military accessory kits as well.